The West Wight Sports Centre Health and Fitness Day is a big hit. People came to take part in fitness activities and beauty treatments. The IW Health Authority were also present giving advice the dangers of smoking and alcohol. 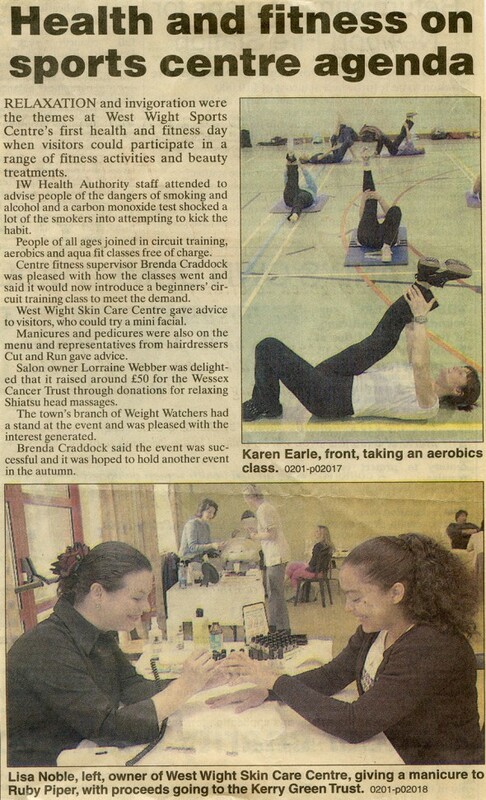 There were also facials, manicures and pedicures on offer with advice from Cut & Run hairdressers where £50 was raised for Wessex cancer trust and Brenda Craddock the Centre fitness supervisor said the event was a big success and they hoped to repeat the event the coming autumn. This entry was posted on Monday, November 19th, 2012 at 11:39 am. It is filed under The Sports Centre and tagged with aerobics, alcohol, beauty, Brenda craddock, carbon monoxide, county press, Cut & Run, Cut and Run, Fitness, Freshwater, Hairdresser, Health, Invigoration, Island, Isle, Isle of wight, Isle of Wight health Authority, IW Health Authority, Karen Earle, Kerry green Trust, Lisa Noble, Manicure, massage, Pedicure, Pool, Relaxation, Ruby Piper, shiatsu head massages, smoking, Swam, Swim, swimming, swimming pool, treatment, Weight Watchers, wessex cancer trust, west, West Wight Skin Care Centre, West Wight Swimming Pool, Wight, young. You can follow any responses to this entry through the RSS 2.0 feed.